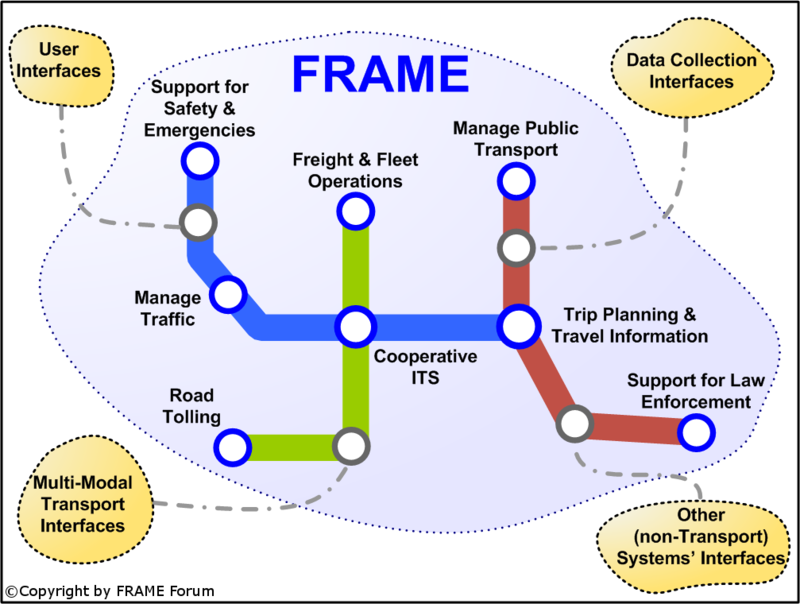 Welcome to the Home Page of the European Intelligent Transport Systems (ITS) Framework Architecture, often now known as The FRAME Architecture. It was created to provide a minimum stable framework necessary for the deployment of integrated and inter-operable ITS within the European Union. See Background for more information on its history. The FRAME Architecture comprises the top level requirements and functionality, or the Use Cases, for almost all the ITS applications and services that have been considered for implementation somewhere in the European Union. It is at a “level” such that it can be used as a reference by all ITS architects, and is intended to be the foundation for building the other types of architecture that will be necessary. It will enable them to guarantee compliance at the interfaces of other systems so that seamless services can be provided to cross-border travellers, and an open European market of compatible components can be established. Most of the work has already been done, and there are FREE Tools available from this website to help you do the rest. If adjacent authorities both have ITS Architectures based on FRAME then it is easy to identify commonalities so that common services can be integrated to provide inter-operability. Note: The FRAME Architecture does NOT provide detailed designs for equipment. It only describes what is required and not how to make it. It has already been used by a number of Nations, Regions, Cities and Projects. What kind of information do you want to find out about the FRAME Architecture? Technical – What kind of technical information are you looking for?